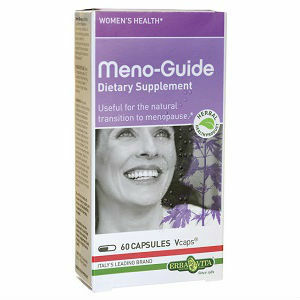 Meno Guide is a natural supplement that makes the transition to menopause easier and eliminates the problematic symptoms associated with it. The ingredients have been dried, titrated and standardized to guarantee quality. Vitamin D (as cholecalciferol) – Required for absorbing calcium and maintaining adequate bone density. Calcium (as bibasic calcium phosphate) – Required to keep bones and teeth healthy. Phosphorus (as bibasic calcium phosphate) – Keeps bones healthy. Helps reduce hot flashes and maintains proper blood circulation. Also involved in proper functioning of muscle, kidney and heart. Kudzu root extract (Pueraria lobata) – Rich in plant steroid hormones which are similar to estrogen, and prevents menopausal symptoms which are caused by lack of estrogen. Flaxseed extract (Linum usitatissimum) – Reduces hot flashes and night sweats. Also lowers cholesterol levels and keep cardiac system healthy. Caigua (Cyclanthera pedata) – Has antioxidant properties, delays ageing. Reduces cholesterol and blood sugar. Also keeps gastrointestinal system functioning well. Black Cohosh root extract (Cimicifuga racemosa) – Reduces hot flashes, mood changes, insomnia and other menopausal symptoms. Dong Quai root extract (Angelica sinensis) – Has estrogen-like properties and reduces menopausal symptoms. Motherwort – flowered aerial parts (Leonurus cardiac) – Simulates properties of estrogen and can reduce menopause symptoms. Black Horehound – flowered aerial parts (Ballota nigra) – Antioxidant and anti-inflammatory. Relieves symptoms of menopause in some women. Soy bean seed extract (Glycine max) – Simulates properties of estrogen and can reduce menopause symptoms like hot flashes. Horsetail extract (Equisetum arvense) – Keeps bones healthy and prevents osteoporosis. Also relieves urinary ailments. The ideal recommended dosage is 2-3 capsules daily with water. 1 or 2 capsules can be taken in the morning and 1 can be taken at night. A 60-capsule bottle is priced at $22.29 but is available at a discounted price of $16.63 inclusive of shipping within US on third party websites like Amazon. The company does not offer any guarantee in terms of refund or accepting product returns in case it does not meet quality or effectiveness expectations of the customer. While this is a good, natural product, the fact that it does it not come with any guarantee is a negative. Price-wise, it is quite reasonable, with a month’s supply costing around $16.63. Jackie Horowitz	reviewed Meno Guide	on June 15th	 and gave it a rating of 2.5.